"Auntie Em! Auntie Em! It's a hurricane -- and it's in Indiana! Yes, on Sunday afternoon, Ike paid a visit to the Ohio River Valley. By this point, he was reduced to category one winds -- 70-80 m.p.h., which lasted from about noon to 3 p.m.
We fared pretty well. The Lord protected us and our house, as both large maples in our front yard fell to their demise. But we joined over 500,000 people in the area who were left without electricity. At first we had no idea how widespread the power outage was, but after several hours of it not returning, we turned on the battery-powered radio. We then realized we would not have electricity before nightfall. Around 8 p.m. we picked up Kristi's mom and went to Walmart. We got a new tank for our gas grill, so we could cook. (Our stove, along with all appliances in our home, is electric.) We also picked up a few sundry items. "C" and "D" batteries were sold out! The Lord blessed us with mild weather. It has been in the 70's through the day, and 50's-60's at night. 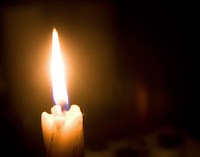 We have spent two evenings by candle light, listening to the radio, and being forced to slow down. All in all, not bad. Our biggest concern has been our full freezers. Last night (Monday), our trustees came over and ran a generator for a while on the deep freeze. Today they came back for an hour. This afternoon, another member whose power had come back on loaned us hers. After Tuesday dinner and a round of "Hand and Foot" (cards), we returned home to find that we once again were members of the 21st century! After feeling like "Little House in Lanesville" ala Laura Ingalls Wilder, it feels good. A little power outage is fine from time to time, reminding us of priorities. But after 48 hours, it is nice tonight to return to conveniences!